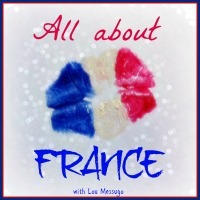 Today (2nd February) is "la chandeleur" in France. La chandeleur is a Christian religious festival celebrated every year on that day (40 days after Christmas). The word comes from the Latin festa candelarum (the day/celebration of the candles). As I am not one to educate you on religion, you can read more about what the date means in the Christian calendar here. Today this day is associated with eating crêpes in France. The tradition apparently dates back to the custom of handing out cake-like bread in Rome to the pilgrims. This was also a way to show that winter was almost finished but one still had food supplies. There are similar celebrations in other cultures and religions. For example, in Judaism, another light festival, Hanukkah, is also associated with eating doughnut-like cakes. 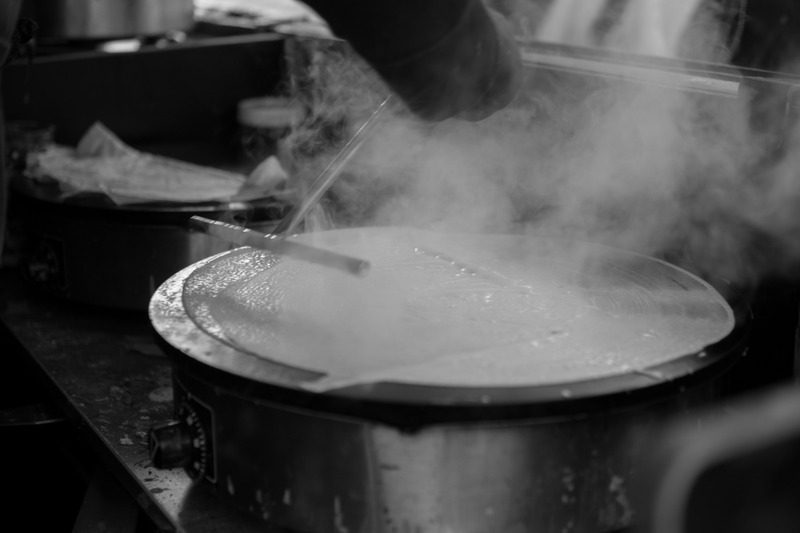 While cooking the first crêpe, it is customary to toss it in the pan several times in a row to ward off bad luck for the coming year. An old tradition claims that peasants used to do it while holding a coin in their left hand to attract luck, happiness and prosperity. These traditions still exist today. 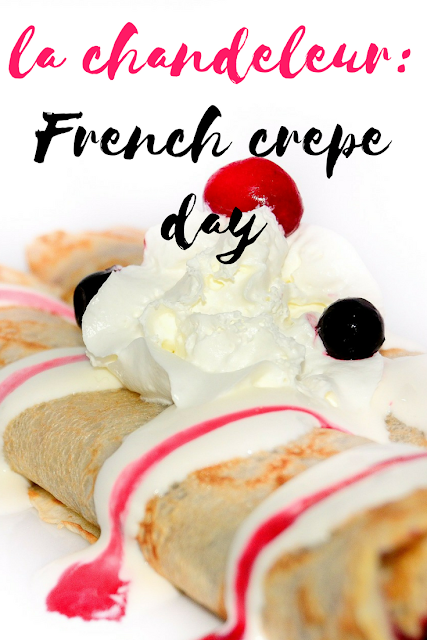 Most French families will have a few crêpes on that day (as well as on Mardi Gras/ Fat Tuesday). Below I share a traditional recipe for crêpes. In case you are not familiar with crêpes, they are the French version of pancakes except much thinner. Our daughter loves them and can almost make them on her own. We often make them for breakfast but kids also love them for desert or as a snack in the afternoon. But I also wanted to share a recipe for a savoury version my mum used to make us. 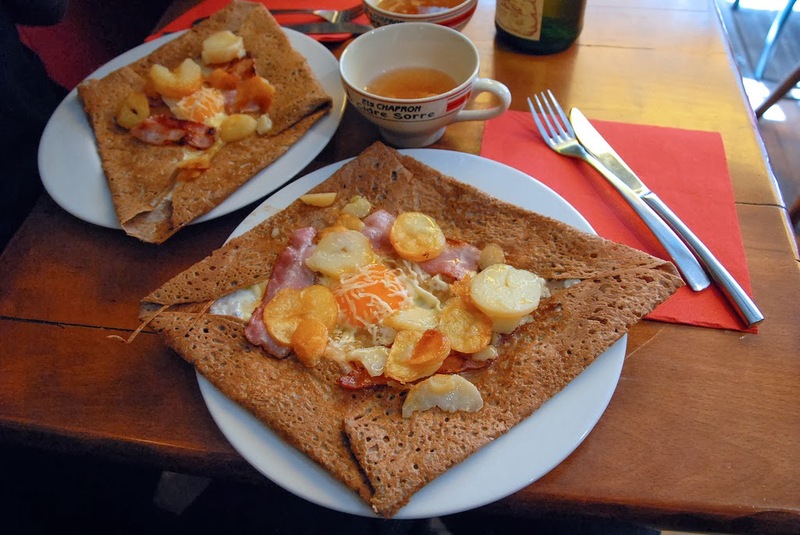 Savoury crêpes are called galettes. These are not the same galettes as the ones eaten in January despite the same name. These are from Brittany (in Western France) and are basically the same as crêpes but with a different flour (usually buckwheat) and filled with savoury ingredients. They are delicious as a main meal with a side salad. Fillings vary hugely depending on the region and how adventurous you may feel. A whole meal with French crêpes! What else would you like? My favourite is a teaspoon of sugar and some lemon juice, but you can also add jam, caramel, nuts and raisins, honey, banana and chocolate, pear, whipped cream and chocolate, ... the possibilities are endless. The process is the same as for the previous recipe. When you turn over the galette, add your toppings and let them warm up directly in the pan on top of the galette. Fillings ideas: a traditional egg, ham and cheese is the best. But why not try warm goat's cheese, lettuce and walnuts or salmon, lemon, cream and chives. Great recipes! We LOVE crepes - galettes are a french Canadian tradition as well (from our French ancestors of course) and big family breakfasts always include buckwheat crepes with ham, cheese, and maple syrup. i had no idea galettes were also eaten in Quebec. Yum... One more reason I love Quebec. We love galettes! We cheat and buy them ready made and they make for such a quick and easy and savory meal! Family's favorites are reheating the galette in some warm salted butter then adding a thin layer of egg, topped with grated emmental, a slice of ham and folded in half. One day when I am feeling less overwhelmed than today, I will try to make my own galettes! And maybe someday it will coincide with the Chandeleur! Thank you for the great recipe. I was going to take my family to a local creperie, but you've inspired me to try to make them at home, too. Bon appetit! You are lucky to have a creperie nearby! Have you been to Cafe Pan in Karlsruhe? I only went there once but I quite liked their pancake/crepe thingies. I love buckwheat galettes, the best I ever tasted were in Brittany, we don't have any good creperies close to us here in the Charente Maritime sadly! Thanks for that list - some great ideas for fillings which I must try.